Almonds have a mild buttery flavor and are among the most nutritious of nuts. A popular choice as an ingredient or garnish in cooked or baked foods, almonds add crunch and taste to foods. Although almonds can be used whole, some recipes call for slivered or straight-cut almonds. 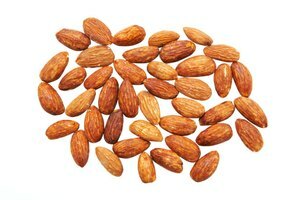 Almond slivers are a delicious addition to desserts, beverages, stir-fries, salads and soups. You can buy them at a grocery store, but it's quite easy, and more economical, to slice them yourself at home. Fill a small saucepan with 1 cup of water. Set to boil on medium heat, to blanch the almonds. It's easier to sliver blanched almonds, since they're soft and can be cut evenly without splintering. Pour the boiled water over 1/2 cup of whole, unpeeled almonds. Allow the almonds to soak for five minutes, to soften them. Drain the almonds then rinse them with cold water. 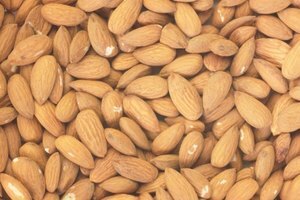 When the almonds are cool enough to touch, hold one between your thumb and forefinger and gently press it to peel off its skin, which will slide off easily. 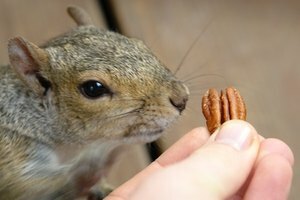 Repeat this process with the rest of the almonds. 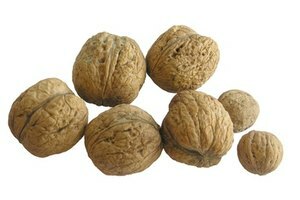 Set the almonds on a chopping board. Hold an almond vertically and slice it lengthwise with a sharp knife. 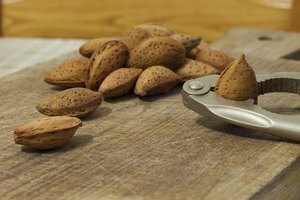 Depending on the size of the almond, slice between three and five slivers per almond. Repeat this process with each almond. Spread out the slivered almonds on a baking sheet and put them into the oven, heated at 300 degrees Fahrenheit, for three minutes, to dry and toast them. Use as desired. Store any unused slivers in an airtight container, in a cool, dark place. Retain their crunchy taste and flavor by preventing exposure to moisture. Slivered almonds become rancid faster than whole almonds. For long-term storage, place them in the refrigerator to prevent deterioration.